When it’s 9pm and you haven’t eaten yet you have a choice. Don’t eat, or knock up a fattoosh. I made this in less than 15 minutes! I’ve made a number of fattooshes (fattooshi? not sure what the plural is). Ottolenghi’s fattoosh has a buttermilk dressing and is diced smaller. This one is very chunky – those cucumbers and tomatoes in the picture are 1.5cm dice. 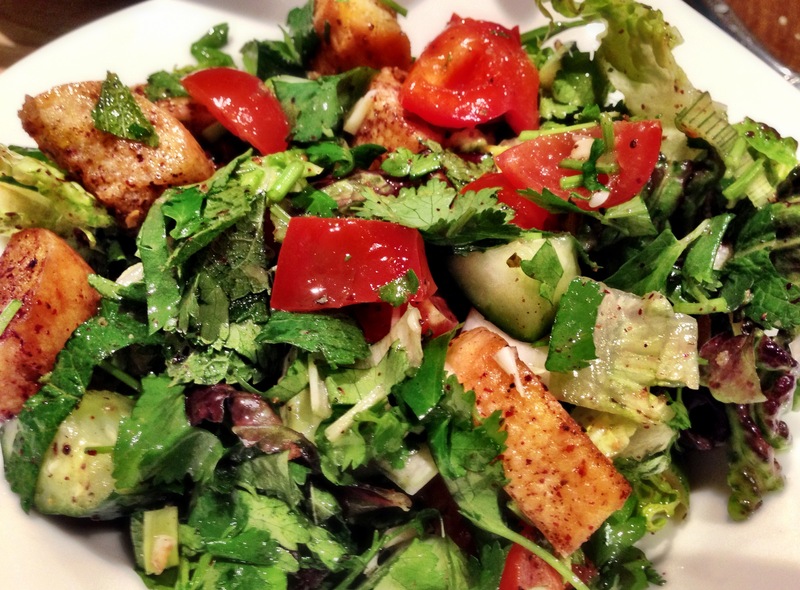 Fattoosh belong to a family of dishes known as fattat – which tends to use stale flat bread as a base – which usually has sumac over it to give the dish a sour taste and it will usually have parsley in it. Fatt means crush! oosh is just a suffix – so fattoosh I guess means crushed. This dish – like a number of dishes in Veggiestan – has a lot of fresh herbs. This has a handful of parsley, coriander and mint (well it’s supposed to – I always put more – much better than throwing it away). This is incredibly zingy, crunchy, fresh and tasty. The olive oil, garlic and lemon juice dressing really gives it a kick. Also in the dish are peppers, black olives and spring onions. And I really love the toasted bread in olive oil, dusted in sumac. Sumac is amazing – it always brings toasted bread to life. The recipe calls for pitta – but I didn’t have any so I just diced a french stick and did it with that. The other good thing about a fattoosh salad (we just decided the plural of fattoosh is ‘fattoosh salads’) is that – even at 9:30pm – you can stuff your face with this endlessly and never feel full up. This entry was posted in Sally Butcher, Vegetarian, Veggiestan, Want to make again and tagged fatoosh, food, recipe, sumac, vegetarian, veggiestan by tenuoustoaster. Bookmark the permalink.